How to decorate open shelves of kitchen? There are two types of people, one who believe that the open shelves in the kitchen are handy for storing and using utensils, plus for charm and decoration; and others people who think utensils, plates and glasses, towels and household cleaners in the kitchen shouldn’t be exposed. I personally like to decorate open shelves of kitchen, especially if you have them in order, look nicer, also the kitchen looks bigger and spacious, you can have everything at hand, kitchen looks very attractive as well as decorative. Open shelves that are usually included in the kitchens allow the display of decorative items. If you like the open shelves in the kitchen here I bring you elegant ideas for your kitchen so you will learn how to decorate open shelves of kitchen. There are 3 ways to complement and to decorate open shelves of kitchen. 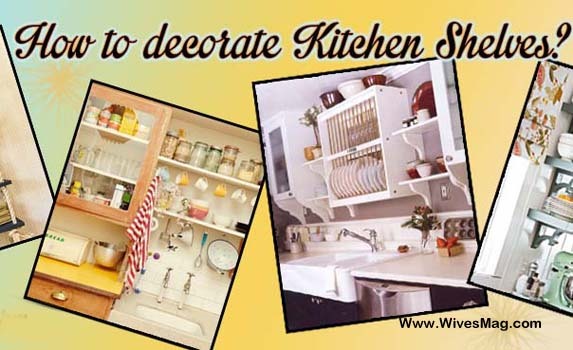 The first way to decorate open shelves of kitchen is, to keep only 2 or 3 shelves. These are ideal for decorating with dishes, utensils, jars, bottles, etc. stuff. The second to decorate open shelves of kitchen is, to replace the top half of the shelves with closets. This makes the top of the wall of the kitchen brighter; with light stuff the entire kitchen will give the feeling of spaciousness. The third way is to keep more than 2-3 open shelves with no closet. This makes the kitchen look much more elegant than a traditional, but be very frank, it’s tough to keep clean. I did well the first time and I regretted because it was got dirty easily, I prefer the first or second form. Make open shelves in your kitchen that go fit to the color scheme, theme and style of the kitchen, in addition, shelves storage should meet any need you may have. You need the following items for spectacular appearance and to decorate open shelves of kitchen. Paint the shelves to contrast with the walls or add an “explosion” of color. Decorate the space behind the shelves. Use fabric or wallpaper behind the shelves; paper should be complemented to the color of the walls or cabinets. Or you can hang decorative plates on the wall to serve as decoration. Use plate racks to hold them in their place. Arrange dishes as you would like, if they were inside closed cabinets, use a single color or stay within the range of colors of your kitchen to create a natural look. For example, use covers of dishes with red, grey and cream if the kitchen is in light green color, if your kitchen is decorated with blue, green or yellow, use light colors for dishes. Hang cups with hooks on the bottom of open shelves, if they look good with your kitchen’s decor and style. Arrange handy items such as baking tools, containers or utensils or occasional baskets. Keep sugar, flour and other items commonly stored in transparent or color containers, depending on your preference. You can also arrange the decorative elements on open shelves, if you want to make your dishes less prominent. For example, add a vase, plants, flower baskets, containers or ornaments. How much dish towels can be harmful to health?